MommyLawyer: What's in a Name? I began homeschooling my children when Casey was 4. 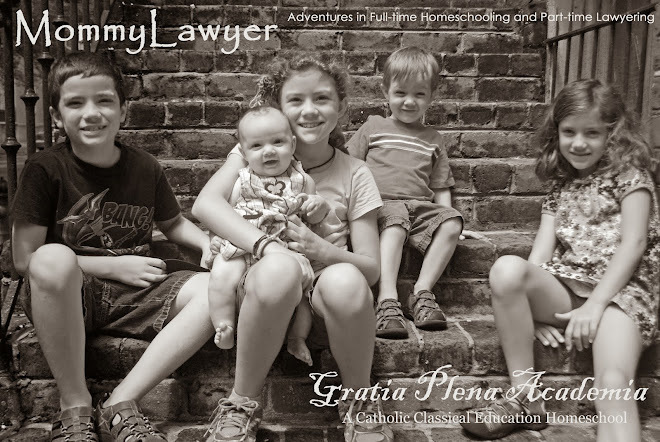 In those early days of homeschooling I worried about so many things. Am I doing it right? Am I making a huge mistake? What if I miss something? Those were the big questions. I also struggled with the idea of loss of identity. When I was in elementary school, we had a school song. In high school, there was a mascot. What would my homeschoolers identify with? I wanted a name for my school so I joined and opened discussions about it on various homeschooling boards. I found that most people just used their last name paired with School, or more often, Academy. I didn't want that. My children have a last name by which they are identified. "Last Name Academy" wasn't cutting it for me. So my quest began for a school name. I've always loved the word "grace," the name Grace, the quality of grace. Being graceful - not being clumsy - is a quality I long to possess. Being in a state of grace is a place I constantly strive to be. And what better example of grace and motherhood and as a teacher could I hope to find than Mary? My school's name is a constant reminder to strive to be so worthy - so full of grace - as to be chosen for amazing things! My school's name is a prayer for understanding, guidance, and protection. And the face of my school is the Mother of mothers. Yes, I chose the right name!